Vertical door pass through spray cabinet parts washers offer the advantages of a multistage turntable spray cabinet washer while maintaining the benefits of conveyorized inline pass parts washer. 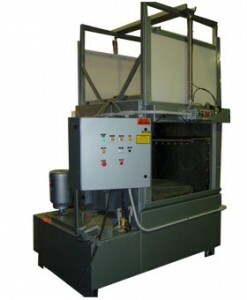 These aqueous parts cleaner systems are also known as guillotine door parts washers. The vertical door parts washer cabinet allows for loading of parts from one cell and unloading cleaned, rinsed and dried parts into another cell of a cellular manufacturing production factory. 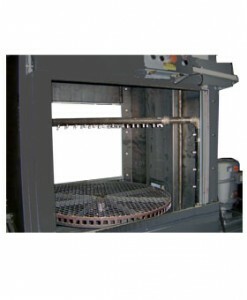 The spray parts washer cabinet with vertical doors allow easy loading of parts onto rotating turntable which allow for 360 degree spray coverage on parts. This aqueous parts washer system can also be combine with recirculated or fresh water rinse to ensure wash solution is removed from the part. Regenerative heated dry stage is also an option to allow for automated wash, rinse and dry part processing with vertical pass thru doors. The detailed picture above shows the top, side and bottom spray nozzles to ensure complete part impingement with the part washing alkaline cleaner. The aqueous parts cleaner turntable rotates to further ensure complete part spray coverage. 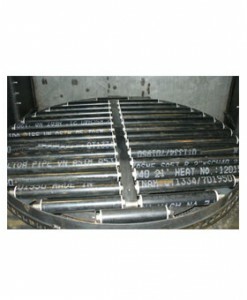 A roller conveyor on the turntable can be added along with load and unload roller conveyors to allow for easy automated load, processing and unloading of heavy parts. Mechanical Labyrinth Door Seals ~ No rubberized seals that will leak and need replacing! Large Swing-Out Doors for Full Access ~ there is not a more accessible turntable in industry. Industrial Control Panel ~ NEMA rated UL / ETL certified electrical panel closure featuring IEC components with rotary illuminated cam switches. Even though the guillotine door pass thru parts washers are built specific to customer application, below are examples of sizing that can be achieved with these systems. Turntable diameters up to 120” and weight capacities up to 50,000 pounds allow for one of the most diverse pass through spray cabinet parts washer offerings in industry.